The Military Tuck is a simple, 30-second tucking technique that keeps your shirts in place throughout the day, while also giving your shirt a more tailored appearance. Though the Military Tuck has many variations, it is often used by servicemen to give a clean, fitted look to their uniforms. To see results, the Military Tuck should be used on shirts that already fit decently, but may just have a bit of excess fabric. Ill fitting clothing will still look messy and as always, fit is king. Though nothing beats having a tailored shirt, the expense and hassle can be easily avoided if you’re short on cash or just need a quick fix for a day out. To make sure that the technique is done properly, reconsider the idea of tucking your shirt into your pants and instead think of it as pulling the pants over the shirt. When tucking in, shirts often become bunched and wrinkled. Instead, start by making sure the base of your shirt is facing neatly downward. Your pants can be zipped or buttoned so that they sit at the hips but hang loosely. While there are many variations to this method, the simple tried and true tuck will get results without over complicating or taking up too much time. Start by making sure that the base of your shirt is hanging neatly downward. 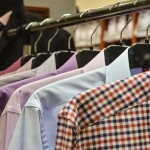 Once you have finished buttoning, straightening and smoothing out your shirt, you’re ready to begin. Pinch the sides of the shirt at the seams and pull tight to collect excess fabric. Once you have a fit you’re comfortable with, fold the excess fabric backwards so that it sits flush against your body. A few things may happen that this point: if your shirt start to bunch you may not have gathered enough fabric; if the shirt is pulling, you may have gathered too much. When you have a look and feel that you’re comfortable with, it’s time for pants. With a bit of finess, carefully slide your pants over the shirt, taking care to keep the folded fabric flush against your body. This goes back to the idea of pulling the pants over the shirt instead of sloppily shoving the shirt into your pants. It may take a few tries at first but once you get it you will have a neat and clean looking fit. When you’ve got the shirt tucked and pants buttoned, run your thumbs inside the waistband from front to back and adjust as necessary. The idea behind this method, of course, is to take the excess fabric in shirts that mostly fit, and hide them in the side seams. By doing this you not only instantly give the illusion of a more tailored shirt, but you have a tuck that keeps your shirt secure for the entire day.